Join the discussion on our forums! 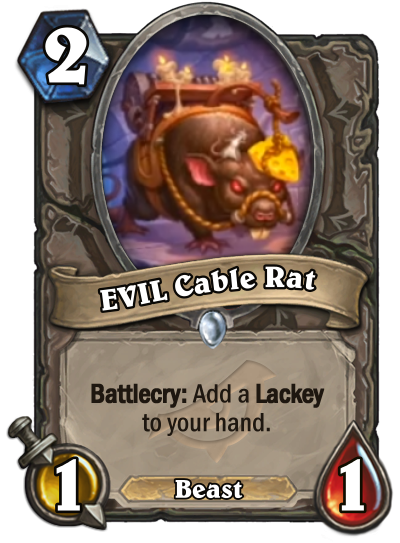 Come discuss EVIL Cable Rat over in our dedicated EVIL Cable Rat discussion topic. Battlecry: Add a Lackey to your hand. Gradually driven to darkness by the promise of unobtainable cheese. People are sleeping on this card. Will non-EVIL classes be able to play it? I mean, I think this card is 'very good' by virtue of default, since there is no other neutral card to give lackeys, and only one per class that generates them. Yep, victory by default... Woohoo!